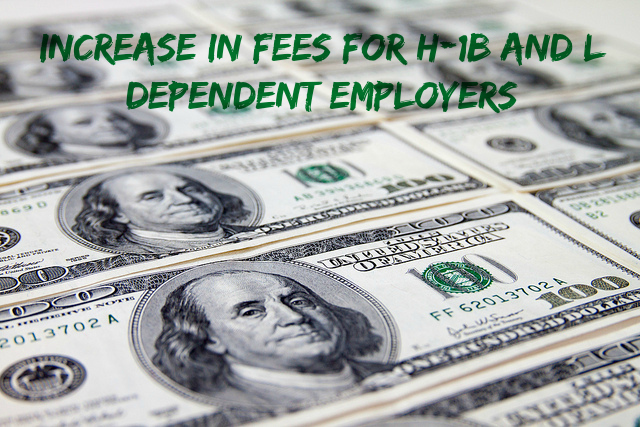 Beginning December 18, 2015, H-1B and L-1 filing fees will increase for H-1B/L-1 dependent employers, employing 50 or more employees, with more than 50% of those employees in H-1B or L nonimmigrant status. This increase in fees comes with the passage of the Consolidated Appropriations Act, 2016 recently signed into law by President Obama, to be enforced until September 30, 2025. The new fee will apply to initial and change of employment H-1B and L petitions filed on or after December 18, 2015. The additional fee will be $4,000 for H-1B petitions and $4,500 for L petitions. USCIS will be revising Form I-129 and I-129S to reflect the new law and the additional fee. Petitioner’s are advised to accurately complete Item Numbers 1d. and 1d1. of Section 1 of the H-1B Data Collection Supplement and Item Numbers 4a. and 4b. of the L Supplement. Failure to complete this information accurately and include the appropriate fee where necessary may result in the rejection of your petition beginning February 11, 2016. CIS reserves the right to issue a request for evidence to determine if the additional fee will apply. In these cases, the original filing date will be maintained as the date of receipt of the petition. For a comprehensive list of H-1B and L visa filing fees click here. Please contact us for a free first consultation.